Blog posts are a great way to create specific content targeting long tail keywords. You probably already know that one of the best things you can optimize for is the location of the shoot. This is especially true for wedding photographers because wedding venues often get quite a bit of search traffic. But what happens when you photograph more than one session in the same location, or more than one wedding at the same venue? Or what if you are a newborn photographer and you only photograph in your studio? In most cases, you don’t want multiple pages or posts on your site targeting the same keyword, so how do you write different titles, URLs and descriptions for these similar posts? This has been a popular topic over in the Facebook Group, and today, we’re going to tackle it head on! 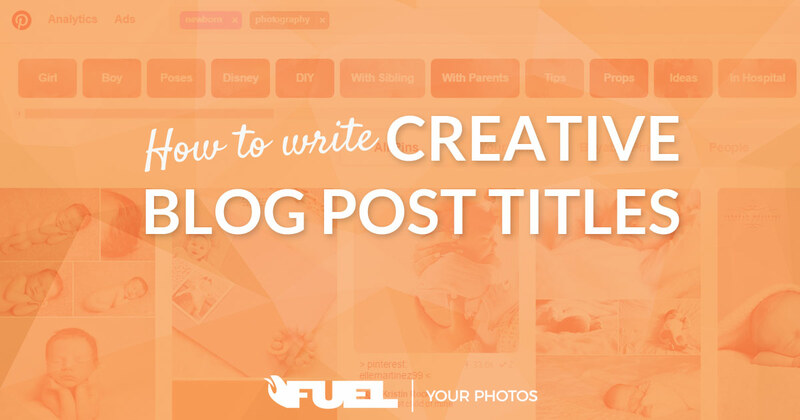 In this post, we’ll explore some options for creative blog post titles for photographers. But before we do that, let’s take a minute to talk briefly about cornerstone content. This is important because when you have multiple posts from the same venue, you’ll often need to pick the one that you want to rank for the strongest keyword variations. Let’s look at an example of a wedding venue. In my city, we have a popular wedding venue called “The Millstone At Adams Pond” and I’ve probably photographed 25+ weddings there. In my case, I could do one of two things. Pick a favorite wedding from Adams Pond and use that blog post to target my main Adams Pond keywords (hero article for this venue). Create a page on my site specifically for people who want more info about Adams Pond, including basic information on the page and linking to other posts that feature Adams Pond weddings (topical silo for this venue). This is my cornerstone content for that venue. It should be comprehensive, valuable, and relevant for anyone searching for the venue. Whichever method I choose, I need to make sure to optimize that post or page with my main Adams Pond keywords, then point all other related posts to that main piece of content with internal links. I’ll keep with the same venue I’ve been using and give you a few practical examples of what this might look like. In this case, I’m going to choose to create a topical silo. Basically a summary page for all of the information I have about the venue. This post would be optimized for all general terms related to the venue. You can see how that could easily become a long page that answers all common questions people ask about a particular venue. That is exactly what I want for this type of cornerstone content. Now that I’ve chosen one post or page for the main venue term, I can get a little more creative with optimizing future posts from that venue. Those future posts may not be optimized specifically for that venue at all, but they can still help build authority to your main content for that venue. These are just a few quick examples, but you can see that the possibilities are ENDLESS. All of these are descriptive of weddings at the same venue, but they are very different titles. They aren’t competing with each other or trying to over optimize for one keyword, but if you start to look at them as a whole, they are very descriptive of the venue. Remember, a title is one of the most important factors for helping a visitor decide if they want to click your result. You should be intentional about writing these for search engines, including terms that people actually use when they search, but more importantly these should be written for humans in a way that makes your content look interesting! So how does this content support your main cornerstone content for that venue if you don’t use the venue name in the title? Each of these new posts should be optimized for specific long tail keywords that are unique to the session or wedding. You should still write a few paragraphs, use alt text, and tell stories about the photos. As you write the post, you’ll mention the venue or specific things about the venue. When you do this, you should LINK back to your cornerstone content. When I mention the venue name there, I link it back to my main post about Adams Pond, which tells Google that it is a relevant page for that keyword! Internal links may not be as powerful as backlinks from other sites, but they are still very important in helping Google understand the actual relevance of a page on your site. I can still use Adams Pond in some of the alt text of the images on these secondary posts, but I don’t need to OVER optimize for Adams Pond, because then it starts to compete with my cornerstone content for that keyword! Bonus tip: if you have a list of links for vendors at the end of your post, name the venue and link to your page about the venue instead of the venue website itself! Of course you’ll link to the venue website on your main page about the venue, but this lets people see what they really want to know about the venue while staying on your website! One great thing about using this strategy is that it relieves some of the pressure around blogging normal client work. Your cornerstone content should absolutely be 300+ words (sometimes it may even be thousands of words), but your everyday posts that stand on top of those foundational articles don’t necessarily need as much text. Don’t get me wrong, more text is still often better (more chances to rank for long tail keywords), but using this method of keyword targeting allows you to relax a little when it comes to keyword counts. We’ll do an example for you too, and I’ll give you some more tips on how to get creative with your titles, but first I want to clear up one other thing. This may be slightly advanced for some, but don’t worry, I’ll get back to easy examples in a minute. Your HOME page is most likely your “cornerstone content” for most of your main head keywords. So for example, if you are primarily a newborn photographer in Dallas, your home page is most likely what will rank when someone searches for queries related to “Dallas Newborn Photographers.” This can present a few challenges, and isn’t ALWAYS true (in fact Dallas newborn photographers currently has someone ranking in the top 3 with a non-home page right now), but the nuances are a little too complex for this post. For now, I’m going to assume that the home page is being optimized for your main location and service. Because of this, you don’t want to optimize your blog post titles for these same keywords! If you want to rank for other locations or services, those present great opportunities to build out new cornerstone content. Just remember that you don’t want to create separate content for queries that actually have the same intent. In the above example, it doesn’t necessarily make sense to create a piece of cornerstone content for “Katy TX Newborn Photographer” unless you have content that is different and specific to Katy. For the most part, someone searching for newborn photographers in Katy and Dallas want to see the same thing, and the real differentiator in search engines is likely your address and not your on page content (again, there are nuances to this, and every market may present different opportunities, don’t take this as law, but as the general trend). This time, we’ll use a studio newborn photographer as the example. Let’s say you’re a newborn photographer in Greenville, SC. As I mentioned above, your home page is likely the page that will be ranking for the normal head terms you would think about. If you photograph mostly in studio, but are willing to also travel to a client’s home or photograph outdoors, you have a few pieces of cornerstone content there. Once you write one piece of content for these, you can start to link back to those in your future posts. You can also use common questions and topics as cornerstone content. For these posts, you want to use examples from many different sessions and create an informative piece of content that is a resource people want to save and share. There are dozens of these kinds of posts you can come up with for your cornerstone content, and then when you post your normal client work, you go for the really long tail keywords, but link back to this cornerstone content. Mommy Loves Baby Blaise to the Moon and Back! Blythe is the Cutest Little Harry Potter Fan You’ll Ever See! Notice here that you can write these titles to be fun and creative, or to use some location keywords. You don’t have to do one or the other every single time. Sometimes it may make sense to use some location keywords, and other times it may not. Don’t stress too much about the normal client work, and focus your SEO energy on the cornerstone content. Sounds obvious, but often you know your clients better than anyone else will. Think about the things they might want to ask, things they might find interesting, and things they are likely to click. If your client was pinning photos as inspiration for their session or wedding, what would be on that board? Write down these ideas and save them for your titles when they are appropriate! 2. Use traditional keyword research tools. Use some of the popular keyword research tools available for free online, but instead of searching for really specific keywords, use very generic terms. 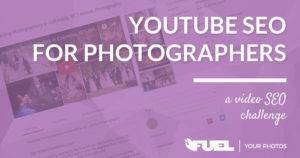 Plug in words like “newborn pictures,” “senior portraits,” “outdoor weddings,” or even just “weddings.” You’ll be surprised at how many suggestions you’ll get with these tools. Ignore the volume and just use these to get an idea of what people might be interested in knowing more about. 3. Use creative keyword research tools. There are two main places I recommend looking for inspiration. Pinterest, and Google Images. When you type in any keyword, it will show you modifiers you can use to refine that search. This is a great way to get a view into the mind of a machine, but also into the mind of your potential clients. Just do a search in the images tab on Google and check out the tags at the top of the results. These are great ideas for words to use in your titles! Type in your generic keywords on Pinterest and look at ALL of the suggestions they make. Bonus tip: check out pin descriptions for even more ideas. Both the descriptions entered by the user and the one given by the site can provide valuable insight! There are some good formats you can follow to keep things relevant but different. Don’t follow templates that make your titles TOO similar, and always just use templates as a basic starting point. There are tons of tools out there to help you write better headlines. I’ve heard people say that if you have 2 hours to write a blog post, spend 90 minutes crafting the perfect title. That might be a LITTLE excessive, but the idea is a valid one. Your title is the one thing that will determine whether someone wants to click to see your post. Get this wrong and your traffic will suffer! One great place to get title inspiration is from wedding blogs, photography blogs, and mommy blogs. Notice how most of them will be written to entice the click instead of written for search engines. Think about the title as it will appear on social media when your post gets shared and keep that in mind when you are writing. Pro Tip: Use site:domain in Google to see titles and meta descriptions from that domain. Try using specific directories to narrow the results. One final tip is to make sure that your site is structured well and that you are taking advantage of existing hierarchy. Be aware of existing categories or tags that may compete with your cornerstone content for the same keyword. For example, if I use the tag “Adams Pond” on my weddings from that venue, a page is created automatically by WordPress to be an archive of all posts with that tag. If that post becomes more valuable than my cornerstone content (hopefully it wouldn’t) that could start to compete for rankings. You can also take advantage of things like tag and category archives if your theme allows it. You can even build out entire content silos around these archive pages. It sometimes takes a little extra work, but is a great strategy for many people! Do you have any great examples of creative blog post titles or cornerstone content? Let’s make the comment section a showcase of examples! Leave your posts below and I’ll check them out. Amazing content Corey!! Thank you for including ideas for a newborn photography! It’s right up my alley! Thanks Kandi! I’m looking forward to seeing how you use these ideas! Thanks, there is a lot of good info here, thanks for the tips. Great post!! Lots of useful tips and ideas for my own blogging! Just heard you on PhotoBizX and came here for some more info. This post is exactly what I was looking for. I shoot on location family/individual portraits in an area of multiple small towns so it’s difficult to optimize for location without naming 20 towns. So I keep the home page optimized for the state (NJ) and then have separate pages optimized for types of shoots (Family Photographer in NJ or Senior Portrait Photographer in NJ) and then have been creating posts featuring specific locations that I shoot at often. Glad you stopped by the post and it was helpful Pete! Your understanding is correct, just keep in mind that in PRACTICE sometimes Google doesn’t want to rank an internal page (like yoursite.com/family) for a query like “family photographers in nj” and instead they’ll return the home page, even when it is optimized for a general term. Sometimes to get Google to stop showing the home page and start showing an internal page, you’ll really have to go all in on pointing your internal links at that page, and optimizing it extremely well with lots of text, images, and helpful information. But for the blog posts, keep using those specific locations and pointing keyword rich anchor text back to your cornerstone pages and that will really help! Amazing article. This is such a great insight and help on how to structure blog posts and pages. I do have a question, because of a problem I’ve noticed now on my website after reading this. I do shoot a lot in same locations, and I’ve been tittled my blog post as : City Wedding Photographer // Bride & Groom and url as http://www.luisefigenio.com/city-wedding-photograper-b&g . So I have many posts with same city wedding photographer title, h1, and url. For me to resolve this issue, what do you recommend me? Re-titled the blog posts and create a different url ( redirecting the old one to new with Yoast plugin) and link all of those posts for one cornerstone optimazed page for that specific city? Luis, it sounds like you understand perfectly, and the steps you listed are exactly what I would recommend. Try it out with a single location first and see if you notice any difference in your search traffic for keywords related to that location, then move on to other locations that may be over optimized! Thanks so much for your quick reply. I will work on it soon. Some questions came to my mind after processing this post and your replies to the questions on this post. 1. Could you share an example of an amazing cornerstone blog post/page of a photographer who is targeting “location wedding photographer”. 2. What are for you the top 3 SEO optimized wedding Photographers website than you came across lately? 3. How is the chance of a page on my website, let’s say “…mysite.com/mycity-wedding-photographer” optimized for “My City Wedding Photographer” rank better than competitors that are ranked for that keyword as their main domain. Assuming they are also optimized and their home page will have more Power ( domain authority, backlinks, internal links etc…) than my cornerstone page right? 1. Well ranking home pages, with stable rankings for years. 3. Landing Pages or pages of wedding photographer websites. —–> Is that the only competitors that I might have a chance to win the race? I know that’s to much, but I will appreciate so much your help on this questions.